Well, there is no polite way around this, so I won't try to sugar-coat it. I will just come right out and say it: Kitty is an addict. Kitty likes to get high by shooting up trees, and this is the fourth time I have had to rescue him. Kitty really is an indoor cat, and his owners have done everything they can to keep him inside. But Kitty's addiction keeps him feeling desperate, so he is constantly waiting and looking for that one micro-second window of opportunity when the door is open to make his mad dash outside. Once he gets outside, he doesn't stop running until he finds a suitable tree, so his owners can't possibly catch him before he gets away. And there is no point in even mentioning Tree Climbers Anonymous because Kitty won't go for it. From what I hear, the meetings are chaotic because even when you can get the cats to show up, they all just do their own thing and don't even pay attention. It's like herding cats. So here we are again. 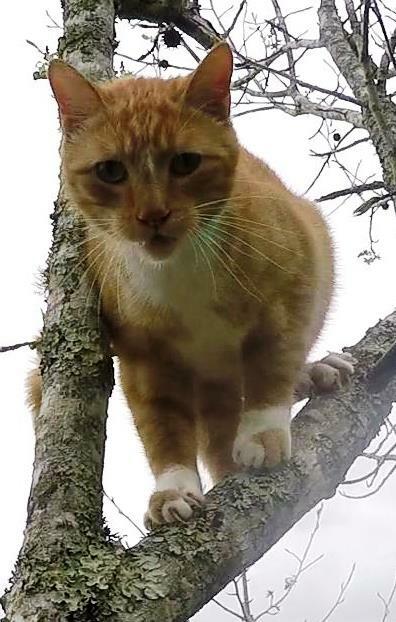 Kitty is 25 feet up in the same tree from which I rescued him the second time. He has been there only one night, but he is ready to come down now. He has had his fix. As I started climbing, Kitty got nervous and climbed up his branch another 8 or 9 feet where he perched and waited for me. I expected him to do that, since that has been his behavior in the past. I pulled myself up into his original spot and secured myself with another rope. He was out of my reach, so I stepped up on a couple of limbs to get closer. I could just barely reach Kitty from there and found him relaxing with me more and warming up to me. Since he was just out of my reach, I offered him some food so that I could lure him into the carrier just like I did on his last rescue. He was interested in the food and ate some, but when I put it in the carrier, he refused to enter it. I put the carrier away and prepared to bag him instead. I have two bags I can use depending on how docile the cat is. If he struggles when I scruff him, then I prefer to use the gloved bag that I simply invert over him. If he is calm and docile, however, then I prefer to put him head-first into a larger, roomier bag. I was not sure how Kitty would react, so I was prepared to go either way. I stretched as far as I could and worked to get into a good position to safely grab him. When I scruffed him, he took it very well and did not fight with me at all. He never struggled or even made a sound as I stuffed him in the bag. In fact, he stayed quiet and calm the entire time he was in the bag, and that is unusual. We released him back inside, and he was so happy to be there. He walked from one person to the next for a rubbing and started purring. After he felt secure and safe, he went to his food bowl to eat, and I left. As it turned out, I arrived for the rescue at the same time that a birthday party was beginning for one of the children in Kitty's family. In the background of the video, you may see and hear some of the party-goers as well as some of the unusual animals that live there. 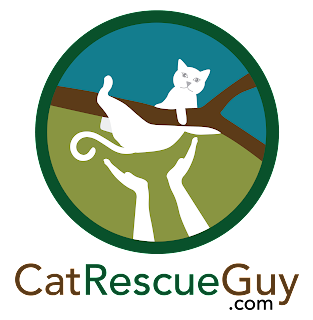 I noticed a small crowd of people checking on the progress of the rescue, and when I finally lifted Kitty off his branch to bag him, you can hear them cheering. 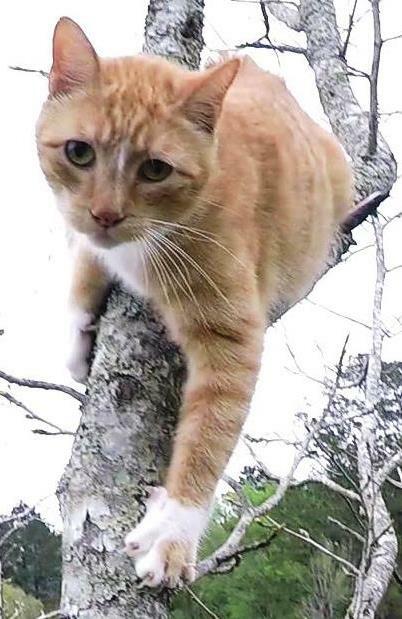 I think Kitty's owners may feel embarrassed to call me when Kitty escapes and climbs a tree since it has happened four times now. I hope they don't though. They are doing the best they can to keep Kitty inside, but he will always find a way and a time to escape to get his next fix. Besides, I really like Kitty. He is quite a character, and I truly enjoy rescuing him. I wouldn't mind rescuing him several more times, and I expect I will likely have another chance to do just that.